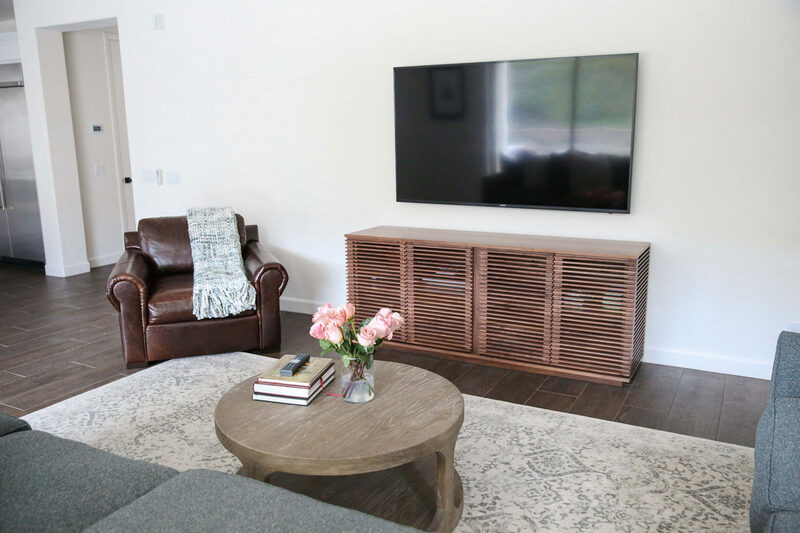 We’re getting closer and closer to finishing our new home, and we’ve finally finished the downstairs living room, so I’m excited to share today! This room is part of the living room, kitchen, and dining area that makes up our great room, so the space is very open and airy. I’ve mentioned before that our previous house had a completely different layout, with much smaller rooms. So the furniture we had there — especially the couches — were much too small for our new home. 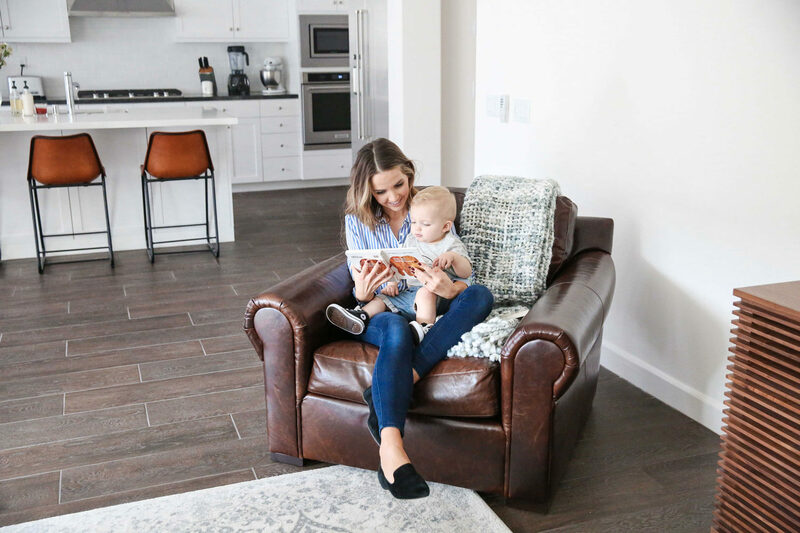 So the first purchase on our list was a big couch for this great room, and we searched high and low for the perfect one at a good price point. We found this large sectional at Living Spaces (it’s no longer available, but this one is almost identical! ), and customized it to include one additional seat on the long side. I loved that its depth makes it feel casual, comfortable, and inviting, but the piping along the cushions gave it a more structured and dressy feel. We chose a dark gray with a subtle speckle so it could hide as much as possible, and so far that has really been the case. Also, included in the price were nine pillows, so we chose the same dark gray and a lighter gray and although I didn’t love them at first, I love the clean, simple look it gives the room. After choosing the couch, we had to decide on a rug. We wanted something subtle and neutral, but with a little pattern so it would add some interest to the room and hide stains. 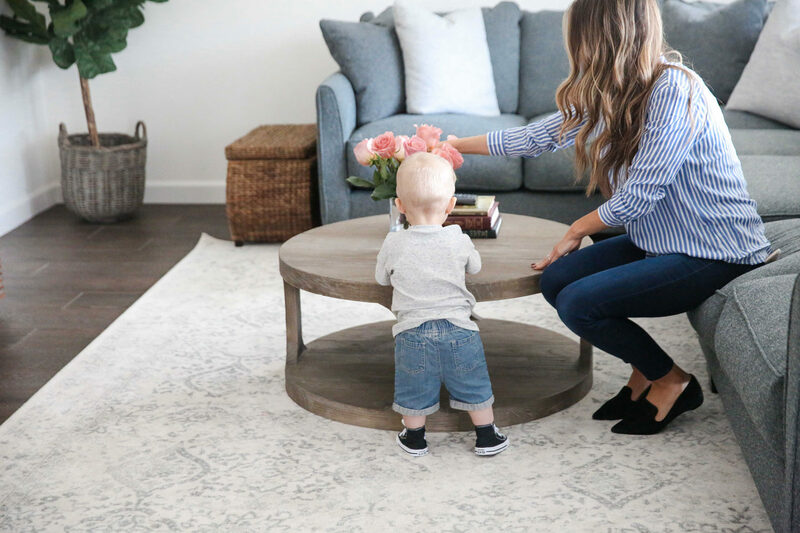 Choosing rugs is SO HARD but we finally landed on this Floral Ornament rug from Rugs USA and I’m absolutely in love with it. It adds the perfect amount of pattern, hides everything, and is timeless. We added a rug grip pad and this rug pad underneath so it has a little extra padding and so it doesn’t move around on the tile. Our other big furniture purchases were our leather chair, the media cabinet, and the coffee table. We stuck with a neutral palette so even though they’re all different shades of brown, they work together. 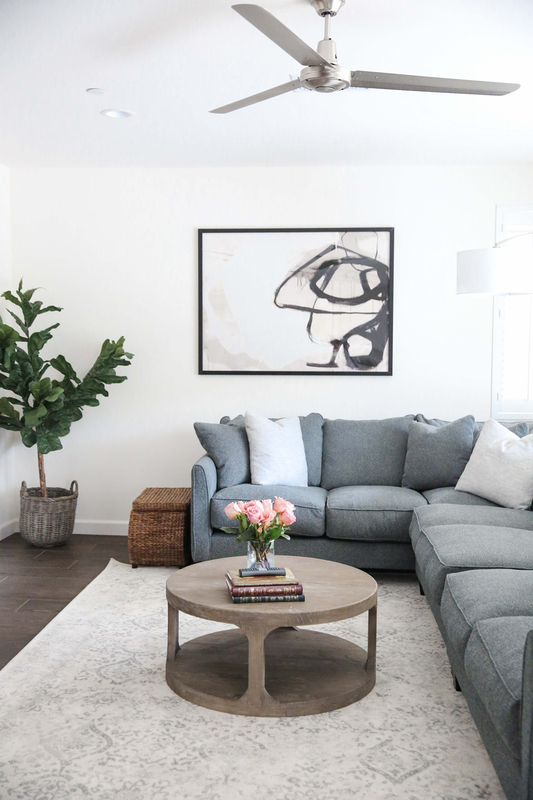 And then we finished the room with accessories like the gorgeous abstract art from Minted, our arch lamp, the chunky throw, and our faux fiddle fig leaf. One of my favorite features of this room is the pocket doors that open to the backyard. The three sliding glass doors disappear into the wall, making the entire room open on to the outdoor room. Since we haven’t finished our outdoor space, we don’t keep these open just yet, but they allow a ton of natural light to come into the room so this room is always light and bright. We finished the room with accessories like this gorgeous art from Minted, a round coffee table, a faux tree, and this arch lamp. 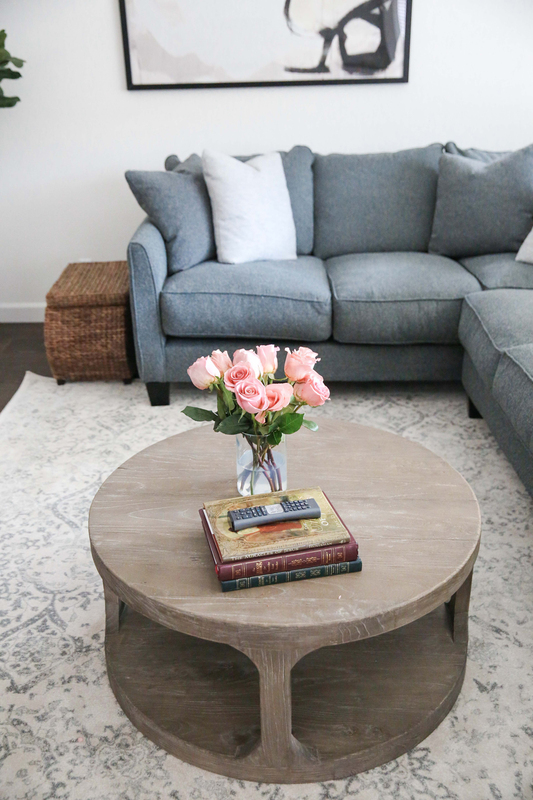 We tried to keep the space really functional, simple, kid friendly (there’s not usually roses on the table ;)), and not fussy, and I think we did just that. I’m completely in love with it! You can see more of our new home progress right here! Gray Living Spaces Sectional – no longer available, this one is almost identical! Such good use of the space and I love the design! It looks so pretty! I had thought the couch was much darker from other photos that you have taken, but I love the color and texture of it! Also, it looks super comfortable! Thanks! So happy with how it turned out. Love you! It looks great! I love the neutral colors. Do you have any window coverings on the sliding glass doors? No, no window coverings. We don’t have any neighbors behind us (our house butts up to a wall) so we don’t have to worry about privacy. And we have a covered outdoor room right outside the doors that gives us plenty of shade so the windows are exposed to direct sunlight. Looks awesome! Love the bright light and clean colors! Beautiful room! Love the line credenza. Can you tell me what size your tv is above it/how wide? You know, I’m not positive. Either 68″ or 70″ — but they measure it on the angle from corner to corner. So the actual width is probably a little over 60? Hi! What size is the Minted artwork? I love it! Love your couch! I was ready to order but then realized they dont shIp to texAs. Have you seen another ine like that from a different company? ah, I wish I knew of a similar one. Maybe just google large fabric sectionals and see what comes up? Floor details?? Ive searched your blog high and low with no luck. 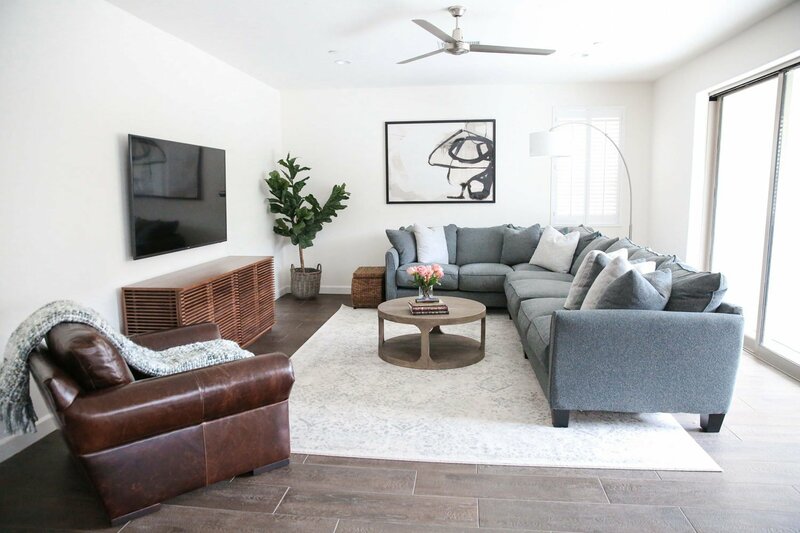 Im intereSted in Where the Woven basket beside the sectional is from. Thanks! Hi! We bought it like 10 years ago at RC Willey in Utah! hello! i think you have linked your leather kitchen barstools before, but could you tell me where you got those? i absolutely love them! looking for something similar for our kitchen. thanks! My husband and I bought a House IN rancho Mission Viejo. Did you get the ceiling fan somehwere local? I love that there isn’t a light in it.